We have a stack of chairs that only get dragged out on Christmas day – you suddenly have more people sitting around the table than usual and the result is a mish-mash of furniture. 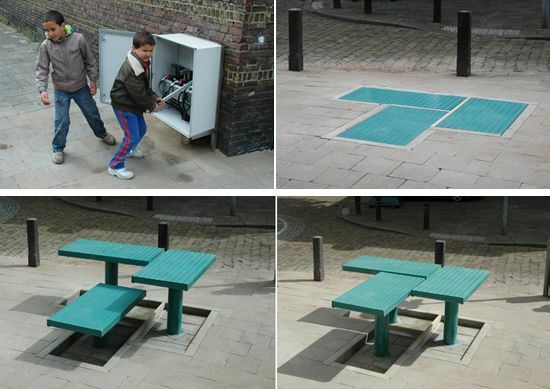 If only extra chairs and tables could ‘pop up’ at home as simply as this ingenious street furniture. Developed by Dutch designers Carmela Bogman and Rogier Martens, ‘pop-up’ is furniture is created to meet the changing needs of public spaces and to blur the boundaries between public and private spaces. Furniture is ‘pumped’ out of the footpath and can be configured at different heights to create bench seats, tables and even a stage. 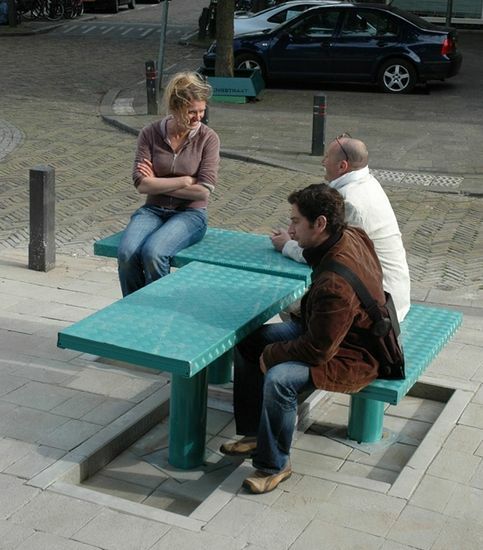 Pop-up furniture is being trialled in Utrecht, in the Netherlands. Keys which give access to the hydraulic pumping system have been distributed to different users of the furniture, allowing them to configure the pieces to suit their needs. Just think – the mother’s group may organise the furniture as bench seats, followed by a senior citizens group setting up games of chess on a table and chairs.